Winner of the American Library Association's "Alex Award," named a "Best Sports Book of the Year" by Booklist magazine, chosen as a "Best Book of the Year" by national bookstore distributor BookSource, selected as a Critic's Choice by People Magazine, and chosen as a finalist for the 2009 Evergreen Award. From Publishers Weekly: Eight miles above the Arctic Circle, there's a village with no roads leading to it, but a high school basketball tradition that lights up winter's darkness and a team of native Alaskan boys who know "no quit." 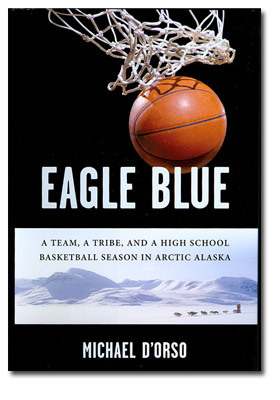 D'Orso follows the Fort Yukon Eagles through their 2005 season to the state championship, shifting between a mesmerizing narrative and the thoughts of the players, their coach and their fans. What emerges is more than a sports story; it's a striking portrait of a community consisting of a traditional culture bombarded with modernity, where alcoholism, domestic violence and school dropout rates run wild. One player compares Fort Yukon to a bucket of crabs: "If one crab gets a claw-hold on the edge... and starts to pull itself out, the others will reach up and grab it and pull it back down." Among D'Orso's unusual characters are the woman who built a public library in her home, the families who adopt abandoned children, and, of course, the boys for whom "hard" has an entirely different meaning (e.g., regularly trudging through "icy darkness" to board flights to Fairbanks for games). With a ghostlike presence, D'Orso lends a voice to a place that deserves to be known.